We start with jumbo Medjool dates, remove the pits, and stuff them with extra fancy walnuts. The end result is pure sweet goodness! Eating Medjool dates helps promote healthy living and gives you a sustained energy burst that can't be beat. 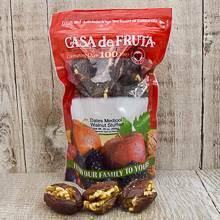 You will enjoy the amazing health benefits of this delicious dried fruit and the protein of the fancy walnuts. Packaged in a 16 oz. tub.